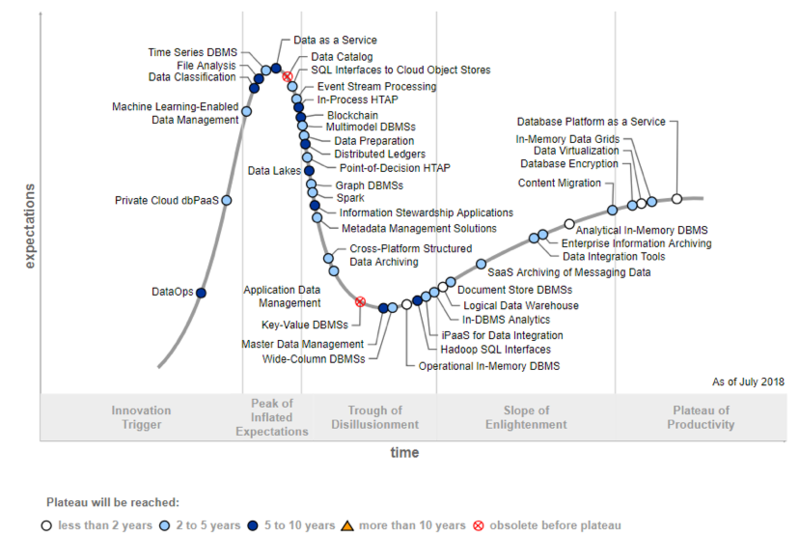 The Gartner Hype Cycle for Data Management helps CIOs, chief data officers (CDOs) and other data and analytics leaders understand the maturity of data management technologies they are evaluating, in order to provide a cohesive data management ecosystem in their organizations (see Figure 1). The Innovation Trigger is the first phase of the Hype Cycle where a breakthrough, public demonstration, product launch or other event generates significant press and industry interest. In addition, more and more vendors are switching to a cloud-first delivery model, which rapidly accelerates several technologies, such as dbPaaS and integration platform as a service (iPaaS). In fact, dbPaaS is less than two years away from mainstream business adoption. In-memory functionality is also becoming more widely available and pervasive throughout all data management technologies. “Those are more delivery platforms than technologies, they can move rapidly to the plateau of productivity,” added Mr. Feinberg. DataOps is a collaborative data management practice focused on improving the communication, integration and automation of data flows between data managers and consumers across an organization. Much like DevOps, DataOps is not a rigid dogma, but a principles-based practice influencing how data can be provided and updated to meet the need of the organization’s data consumers. Private cloud dbPaaS offerings merge the isolation of private cloud database platforms with the self-service and scalability of the public cloud. They recently started to appear in vendors’ portfolios and provide a cloud experience in an on-premises data center. Gartner analysts said private cloud dbPaaS can play the role of a transition technology as organizations develop their long-term cloud strategy. Rudimentary machine learning ML has been used in data management products since the 1970s. Today, with the increased availability of ML and artificial intelligence (AI) libraries, vendors use modern varieties of ML for many self-management operations within data management software. These solutions not only tune and optimize the use of the products themselves, but suggest new designs, schemes and queries. More detailed analysis is available to Gartner clients in “Hype Cycle for Data Management, 2018”. This research is part of the Gartner Trend Insight Report “2018 Hype Cycles, Riding the Innovation Wave.” With profiles of technologies, services and disciplines spanning over 100 Hype Cycles, this Trend Insight Report is designed to help CIOs and IT leaders respond to the opportunities and threats affecting their businesses, take the lead in technology-enabled business innovations and help their organizations define an effective digital business strategy. Gartner analysts will provide additional analysis on data and analytics trends at the Gartner Data & Analytics Summit 2018, taking place September 11-12 in Mexico City and October 23-24 in Frankfurt. Follow news and updates from the events on Twitter using #GartnerDA.